Prophet Nicolaus Suguye is the Founder and the General Overseer of The Word of Reconciliation Ministries (WRM) which is located at Matembele ya pili, Kivule, Ukonga, in Dar es Salaam City, Tanzania. 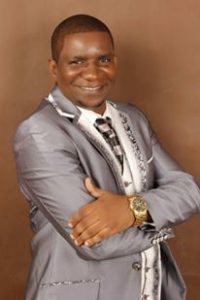 He was born at Kongowe, Kibaha district, Pwani Region in mainland Tanzania and was an evangelist since 1998 and in 2007 he established The Word of Reconciliation Ministries (WRM) which has branches in Tanzania and abroad. Prophet Nicolaus Suguye has helped many to experience a victorious life in God’s word. Through his miracle services, Radio broadcasts, TV broadcasts and the Internet, uncompromising message of God’s love has inspired millions of people to a personal relationship with Jesus Christ. Prophet Nicolaus Suguye is known for his prophetic capabilities to speak the Word of the Lord with accuracy and precision. He remains committed, more than ever, to preaching the glorious Gospel of Jesus Christ, teaching the unchanging Word of God, and expecting the mighty and miraculous power of the Holy Spirit. His use of television, the Internet and other forms of media has continued to build a legacy of the highest standards. Today he reaches millions of people every single day through breakthrough technologies, including different social media outlets.